Colour coding your kitchen is vital. Here's why... - Nisbets Australia Blog - Industry news, trends, recipes and more! Do you want to pass your Food Safety Inspection? One key reason many businesses fail is a risk of cross-contamination in their food preparation practices. In fact, this can be solved easily using coloured kitchen knives, coloured chopping boards and a range of other utensils. A colour coded kitchen could therefore be the key to keeping your premises open and your staff and customers safe. 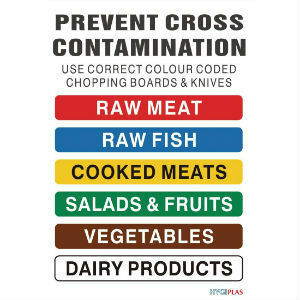 Coloured chopping boards are an essential part of any coloured kitchen, as it is during the cutting process that raw foods are most likely to leak dangerous contaminants. Unfortunately, using colourful boards previously meant compromising on quality. Wooden boards can’t be safely dyed or painted, whilst many plastic boards were easy to mark and damage, leaving a risk of small pieces of plastic entering food. Good news though! High density polyethylene boards are strong, durable and hardwearing, meaning that coloured boards are now often easier to use and more reliable than the alternatives. Available in a full range of colours, colour coded cutting boards are essential for protecting your surfaces from a variety of contamination risks and can be purchased as a set. Multiple colours of chopping boards are an important addition to any kitchen, but are unlikely to be much use on their own. Obviously many chefs favour their own knife but, if this knife is not cleaned thoroughly between different uses, it may transfer bacteria between different colours of chopping board. By comparison, using particular knives alongside particular boards keeps that foodstuff in one area and reduces health risks. This does mean having to use multiple knives, but Hygiplas manufactures affordable knives without compromising on quality. With competitive Rockwell hardness ratings and sturdy, dishwasher safe handles, Hygiplas knives allow you to colour code your knives whilst still guaranteeing a top quality cut. Coloured brushes are the final key to maintaining hygienic and contamination-free cutting areas. Using the same brush on multiple boards will have a similar contaminating effect to using the same knife without proper hygiene procedures. This makes multiple brushes a must! If you choose to use Hygiplas chopping boards, the accompanying brushes are designed to be perfect colour matches, the right texture to clean your boards quickly and effectively and manufactured to be just as long-lasting and hardwearing. It’s particularly important to use colour coded tongs if they are used with raw meat and vegetables. After all, nobody wants tongs which have touched raw pork to be used to serve their salad without an extremely thorough cleaning in between! You can therefore save time, effort and potential contamination by having different colours of tongs. If you use tongs for salad, coleslaw or other raw vegetable produce, green handled tongs should be one of the first purchases of your new colour coding regime. Manufactured by Vogue, the full range of coloured tongs perfectly complements Hygiplas boards and knives, allowing you to affordably colour code your entire kitchen. Made from durable and easy to clean stainless steel, Vogue tongs feature a sleek and straight design to minimise the risk of harbouring harmful bacteria. What colour should I be using? It doesn’t matter. As long as you keep boards, knives and other utensils in their colour groups, it’s actually not hugely important which colour you assign to which food type. That said, most kitchen staff follow a particular system, and there are handy wall charts available to remind you of this. Ultimately, the important thing is making sure your staff all stick to one system, so it’s a good idea to use the most widely accepted one! Can I colour code my kitchen in stages? Ideally, colour coding your kitchen needs to happen all at once, otherwise the elements which are not coloured will contaminate those that are. One key reason for colouring in stages is cost, but with affordable chopping kits of knives and chopping boards available together from Hgyiplas, it can be much more cost effective to just ‘take the plunge’. Is colour coding a kitchen expensive? Just like when buying any kitchen equipment, there are different price options for colour coded kitchen items. For example, when buying colour coded chopping boards, you’ll need to consider the density and depth chopping board that is right for you. This will determine the price. 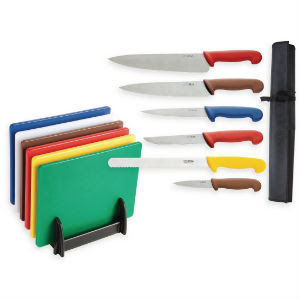 Fortunately, however, colour coded items don’t need to break the bank, with a full set of colour coded chef’s knives available from as little as roughly $80. The price of colour coding will also depend on the size of your kitchen and the number of items which are needed, but this investment has to be measured against the cost of potential closure and reputational damage of contamination.